A career in HVAC should be very lucrative and rewarding. However, being happy and earning the living you deserve depends on the company you work for. It also depends on the people you work with! 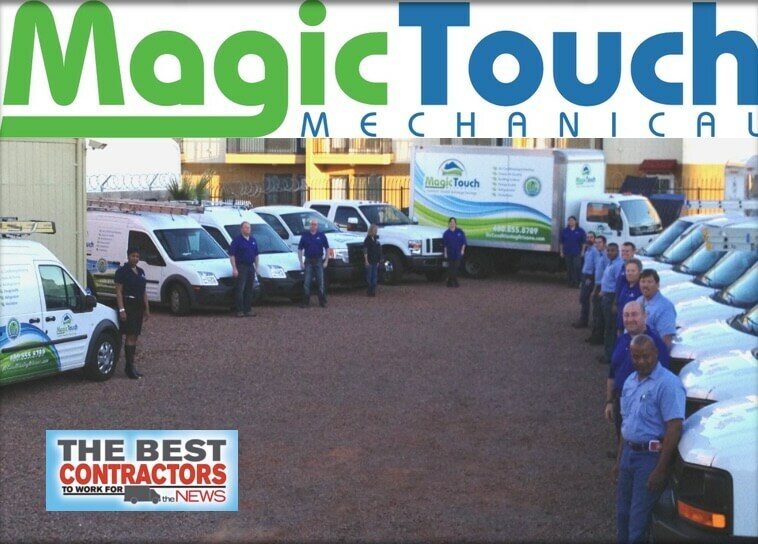 Magic Touch Mechanical was founded in 1997 by an HVAC Technician – not an investment group. Even though we’re a larger company today, our founder, Rich Morgan still works in the business every day 20+ years later. READ HOW MAGIC TOUCH MECHANICAL STARTED & WHERE WE’RE GOING! “The companies that truly cared about their employees always had happy customers. The few HVAC jobs I had where everyone seemed miserable seemed to have equally as unhappy customers.” according to Rich. As an HVAC Service Technician at Magic Touch Mechanical, you can expect to work Monday through Friday (some weekends but NO 24-hour on-call!) providing repairs and maintenance of HVAC equipment including; air conditioning, heating systems and fireplaces. One benefit of working with a medium-sized company is we are large enough to keep you busy year-round, but not so large that you’re “a number”. Magic Touch Mechanical is not only a HVAC (Heating, Ventilation, and Air Conditioning) Contractor, we also provide clients throughout the Phoenix Metropolitan area services such as: Insulation, Home Energy Audits, Fireplace Maintenance and repairs, Shade Screens, and more. If you are the right candidate, we will teach you how to provide maintenance and repairs on more than just HVAC equipment! As a HVAC Installation Technician at Magic Touch Mechanical, you can expect to work Monday through Friday installing replacement air conditioning and heating equipment in residential homes and commercial buildings. Provide in-field and phone technical support to a team of residential / light commercial HVAC service technicians. Implement technical and customer service training. Perform residential & light commercial service calls, ride-along’s, follow-ups, and quality control job inspections. NOTE: This is NOT an “office job”, however some office work may be required. Assess new-hire HVAC Service Technicians and AC & Heating Maintenance Technicians for skills and competency. Assist in interviewing and hiring of HVAC Technicians and AC & Heating Maintenance Technicians. Monitor performance of field technicians and advise them on how to improve. Serve as a technical support for field technicians. Perform HVAC and Refrigeration service calls as needed on a daily basis. Perform service and repairs to niche equipment including; pool heaters, gas fireplaces, energy management systems & controls and other types of electro-mechanical equipment. Develop and provide technical and customer service training to other technicians and company employees. Ability to inspire and lead others to attain company goals. Multi-tasker who enjoys working in the field with diverse teams on varied projects. Top performer who can instill pride of workmanship in self and others. Outgoing personality that blends well with a fast-paced, goal-driven environment. Not required but a definite plus: Working knowledge of home performance contracting i.e. ; energy audits, insulation, duct sealing, air sealing, and similar. Compensation & benefits depends on experience. Let’s talk! As an HVAC Lead Installer at Magic Touch Mechanical, you can expect to work Monday through Friday leading the install of HVAC equipment including; air conditioning & heating systems, duct work related to HVAC, and other types of refrigeration equipment install. Unlike other HVAC companies in the Phoenix area, we do NOT layoff our HVAC Installers, HVAC Service Technicians, or HVAC Maintenance Technicians in the Fall. Magic Touch Mechanical is not only a HVAC (Heating, Ventilation, and Air Conditioning) Contractor, we also provide clients throughout the Phoenix Metropolitan area services such as: Insulation Install, Commercial Refrigeration Maintenance and Install, Home Energy Audits, Fireplace Install, Shade Screen Install, and more. Must have proven In-Home Sales experience selling the following products and services: Air conditioning and heating equipment, ductwork modifications & replacement. Experience selling the following products and services is a plus: Insulation, window shade screens, duct sealing and home air sealing packages and indoor air quality products. Must have a great personality and enjoy working with home owners in a RESIDENTIAL environment. Must have the ability to carry and climb ladders, enter attics and crawl-spaces, and walk on roof-tops. Commissioned sales position. $100k annually if you’re average / $200k annually if you’re very good at what you do / $300k+ annually if you’re outstanding! Keep appointments with customers as scheduled. Inform customers of all special promotions, the benefits of high efficiency equipment and optional equipment and products. Offer financing on all proposals. Present a proposal at the time of the first call if possible, always present the proposal in person, never mail or fax this to the customer. Give sales presentations, as outlined in company selling process, use company presentation book. Turn in all required paperwork to the Sales Coordinator within 24 hours of the customer signing the contract. This includes a picture of the job and all necessary notes, drawings etc., to adequately communicate the job to the operations department. Be available to answer questions that may arise. Certain key business indicators will measure the effectiveness of the Sales Consultant position. Frequency of meeting target revenue goals. Consistently strive for referrals on all jobs. ‪Educate homeowners on energy efficiency. Complete home energy audits assigned. ‪On a daily basis Energy Auditors need to enter attics, attics and crawl spaces. Conduct combustion safety testing and infrared camera scanning. ‪Determine existing insulation levels in attics and identify deficiencies. ‪Conduct visual inspection of HVAC equipment and air ducts. ‪Use Snugg Pro modeling software to enter information attained during energy audit. ‪Actively promote energy saving opportunities based on the audit, explaining program incentives. Six (6) paid holidays after first 90 days of employment. We will help to accommodate requests for unpaid personal days with prior approval, because we know family comes first. One (1) week after first year. Two (2) weeks after second year. Three (3) weeks after fifth year. Eligible for health benefits (available after 90 days). CURRENT – BPI (Building Performance Institute) Building Analyst Certification (additional certifications helpful). Working knowledge of, and experience with the following tools; Blower Door, Duct Blaster, Infrared Camera, CO Detector, Gas Leak Detector, Combustion Analyzer, Digital Camera, Pressure Pans, & Manometer. Intermediate computer and software knowledge including MS Word, MS Excel, MS Outlook. Working knowledge of airflow, to include HVAC duct systems, ventilation, filtration and similar. Working knowledge of common building construction practices and codes. *Special consideration will be given to candidates possessing knowledge of Snugg Pro Modeling Software, Home Performance with Energy Star Program, and utility company rebate programs, as well as experience with HVAC systems. Good writing and spelling skills. Great customer service and people skills a must.